Don't look now, but LeBron James' crunch-time numbers during the streak are off the charts.The Heat continued their winning ways Monday night against the Boston Celtics. And surprise, surprise, it came down to the last few moments. 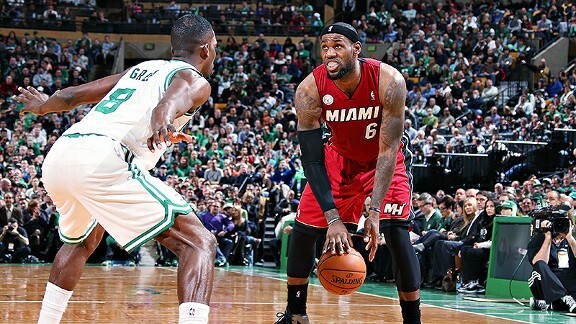 It's beginning to feel like "Groundhog Day" with this Heat team, as it pulled out another win in a tight game Monday. The Celtics enjoyed a five-point lead with 4:56 remaining in the game, but the Heat went on an 11-4 run to close out the game and won by two points. Again, 145-75 in 49 minutes. That's a deficit of 70 points in what amounts to about a full game of basketball. But when we go deeper into the data, we find something more staggering: LeBron James' numbers in the clutch are pretty good. Guarding James is like a constant battle with the pick-your-poison dilemma. Do you double up on him to force him to pass? Or do you bite the bullet and try to guard him one-on-one? Teams still don't have a good answer for that, and the consequences become most evident in crunch time, when the margin for error shrinks to almost nothing. And the numbers reflect this screwed-if-you-do-screwed-if-you-don't quandary when it comes to guarding LeBron. During the win streak, James has been on the court for 48 minutes of clutch time, the equivalent of a full NBA game. His numbers: 49 points, 18 assists and 16 rebounds. It's been said before in this space that James is like a freak hybrid between Shaquille O'Neal and Steve Nash. These mind-boggling numbers certainly reflect that physical yet technical dominance. In these clutch situations during the streak, James has an astounding 46.0 player efficiency rating (PER) and is shooting 45.2 percent from the floor (league average is 40.5 percent). The 49 points is a monster total, but the 18 assists? That's what stands out, especially considering he has only three turnovers during that time. In fact, James has either made or assisted on 32 of Miami's 47 crunch-time buckets over the past 23 games. We saw that pick-your-poison dilemma in action on Monday when James came down in transition with just under three minutes left and the Heat down two points. Paul Pierce managed to wall off the paint and stopped James in his tracks. Only one problem: Brandon Bass shaded off Mario Chalmers to help out, and as soon as he did that, James promptly hit Chalmers for the go-ahead 3-pointer. A few possessions later on the game-deciding play, no help was offered, and James hit the pull-up jumper on an iso against Jeff Green. Screwed if you do, screwed if you don't. Now, this obscene level of production is probably not sustainable, and with only 49 minutes of crunch time, it makes sense to view this merely as a fun foray into small-sample-size theater. But if we zoom out our focus and look at James' crunch-time performance over the entire season, we find that his ability to find the open man in tight spots isn't just a two-month fluke. James has 50 "clutch" assists on the season, which is 18 more than any other player. In fact, he's six assists from having the most clutch assists since the NBA started tracking this sort of thing in 1996 (hat tip to Heat.com's Couper Moorhead for first alerting us of this chase). Deron Williams racked up 55 clutch assists in 2006-07 with the Jazz; at this rate, James should pass his total with about 10 games to go in the season. With all those assists, it's no surprise that James is leading the league in clutch PER this season. His recent torrid play has raised his PER figure to 38.1, just ahead of Kevin Durant's 37.7 rating. (Chris Paul, James Harden and Kobe Bryant trail James and Durant on the clutch PER leaderboard, in that order.) In fact, James averages a triple-double every 36 minutes in crunchtime, continuing a trend from earlier this season. We're not hearing as much hysteria about James finding his teammates for open shots with the game on the line. Sure, his game-winning jumper on Monday probably has a lot to do with that. The conventional wisdom says that the best players should swallow the ball and try to hit the big shot. But it's no coincidence that the Heat are crushing teams when it matters most, and James is racking up assists at an historic rate.